Just thought I'd share my experience of using icing/powdered sugar to reduce the number of varroa in a colony. And to get an opinion as to whether it has been worthwhile. 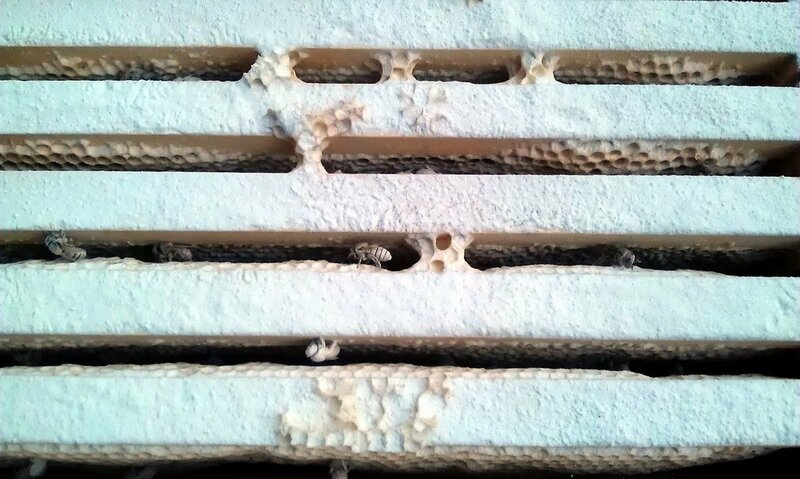 It's a small colony, never over 5-6 frames of bees in a National brood box. 8-9 frames of 11 are drawn out. I've dusted them with 100g of icing sugar 6 times and recorded the daily mite drop over 2 months, September and October in a northern hemisphere autumn. I did 2 sets of 3 treatments, each set within the 12 days of a worker pupa. See the red bars in the chart for the count 24 hours after the treatment. The first set showed a reduction in the number of mites knocked down. I thought it had been successful. The daily drop was 'low', no treatment required but then began to increase so I did it again. The second set showed an increasing drop that was much higher than the first set. 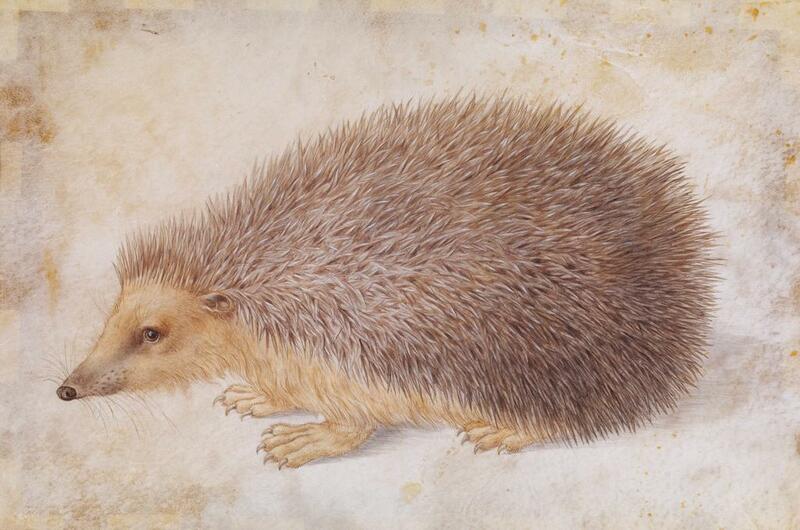 This suggests that something else was overwhelming whatever the removal of a few mites was able to do. Beebase Managing Varroa advisory leaflet. Today, mid November, the colony showing little activity, the daily drop is 14, a high value that another beekeeper might consider using oxalic acid I understand. Not me. So, I hope this is interesting at least. It shows that just checking the mite drop in September would have led me to believe that there was no 'problem'. I wonder is the removal of even 90 mites from one icing sugar treatment of 4-5 frames of bees significant? How many 1000s of bees do I have going into winter and given a high infestation, how many mites might there be? And in the end, was it worthwhile? Are you saying that you dusted them with 100g each time or 100g over the whole period of treatment? 4oz is a phenomenal amount of icing sugar to use on such a small colony. The only time a dusted a colony I probably used less than half an ounce and that seemed enough to me. I don't meant to be unduly critical but my gut feeling is that your treatment of this little colony has stressed it to breaking point. Each time you open it and dump sugar on it, you lose heat and nest scent as well as creating an immense amount of work to clear up all that powdered sugar. For an already small/weak colony which is probably struggling to build up enough stores for winter, that will be a big setback each time. I appreciate that you are trying to do the right thing by them, but this just seems excessively intrusive, particularly at this time of year. Personally I don't open my hives after September but then I don't monitor mite drop or treat for varroa either. Perhaps I am just lucky that my bees don't seem to have problems with varroa anymore, but maybe not stressing my bees is a factor in that. I appreciate that you have put a huge amount of effort into monitoring, treating and recording the results for this and it must be really frustrating to not only not be seeing success but have someone critical of it. I understand that because you don't have much beekeeping experience, you will find it difficult to assess what to do in these situations without going off statistics, but as someone who has made many mistakes in beekeeping myself, I can tell you that I would much rather a colony died by it's own hand than from my interference, no matter how well meaning I was. I will be interested to read other people's opinions, especially those who treat by sugar dusting. Good luck with your little colony and I hope they make it against the odds. While I realise you've followed the advice on both of the links you posted (125g for each brood box) I agree with Barbara - it's far too much for such a small colony. Looking at your photo, the sugar sitting on the top of your frames is at best feeding the bees, but also risking attracting ants/robbing, not doing anything for Varroa. A narrow sprinkler to place the sugar between the frames would give a good (and more economic) result and leave less waste for the bees to clean. I'd estimate that 100g would have treated one reasonably large colony five or six times when I treated. An important part of monitoring is to remember that as the population of bees declines the RELATIVE population of Varroa increases leading to a higher drop rate for a while (I think that's what you have seen). Because of this, monitoring so late in the season becomes less consistent. Yes, the advice in the attached references was 125g per brood box per application. I reduced that to 100g each time. The top picture shows the sugar resting on the top of the frames. I would then use a bee brush to knock it down between the frames before closing up the hive. I've no feel yet of what is unacceptably intrusive or harsh. I know it's sugar in a different form but this colony could down a litre of 2:1 syrup in a day so I reasoned that 100g of dry sugar would be cleared up pretty quickly. Some people feed dry sugar. Watching the entrance they did look a bit miserable covered in sugar but within an hour they were all cleaned up. I have stopped any furthur treatments as the warm sunny days seem to have deserted us, probably until next spring it seems. The last full inspection was the end of September to get some idea of the amount of stores. I've read somewhere that collapsing wild colonies can result in bees drifting into your hives and these may have a high mite count. I'm not sure whether the 18 month old wild colony nearby is still going and a local beekeeper doesn't treat anymore. If my little colony survives the winter or not we will not know whether I have done too much or too little for them. ? Following this thread with interest. Does the 'relative' rate of infection lead to an increased mite drop count solely because there are fewer sealed brood cells so more phoretic mites per bee to be knocked down? You could use the sugar shake non-lethal method of phoretic mite counting but that again means invading the hive at this critical time of year. The 'sugar shake' method is where you take a sample of bees and shake them in a container with some sugar? To get the sample you'd have to lift out a frame and shake some off. I would feel mean doing that. The second link above suggests that sugar dusting is a more accurate view of the number of mites present than just natural mite fall OR an alcohol wash of a sample. The relative rate of infection? . . . would be the change in the % of bees with mites over time. You'd have to know how many bees. We are assuming there are less in October than September, brood area may have been reducing but there may be the same or more bees. ?? Based on the success of the previous few months. So many variables and unknowns. I'm "a bear of very little brain"! If I try to understand this I may have to forget something useful. . . . like how to drive a car?! The Beebase advisory leaflet has to reduce the complexity to a level that any beekeeper can use, ie. the daily mite drop. In my case, checking in September would suggest there was no real problem, in October and November so far that there is. If, as is suggested, dusting removes 30-50% of the phoretic mites and I knocked down 90 mites in the last icing sugar application then I have between 300 and 180 phoretic mites. If I assume I have a colony size of 5000 bees ?? then between 6% and 3.6% of them have mites. Heh yep understood but I was thinking more of the number of mites compared to the number of bees = rate of infestation. How it changes over time depends kn too many variables IMHO. Obviously as the number of sealed brood cells reduces then the mites they contained become phoretic and therefore more are available to drop off. This would appear to em to be why drop numbers can only ever be an indicator of infestation rates as the goalposts are constantly moving. Knocking some bees into the botttom of the hive and scooping them into a shake jar is apparenttky far more accurate and it appears to me less traumatic than leaving them heavily infected with mites. I've got some Christmas vouchers to spend at Thornes and am considering one of these.
. . . a '1kg capacity air bellow operated duster'. Anyone else use one?
. Simply fill the chamber with dry icing sugar, insert tube into hive through the floor and pump vigorously. Moving the bellows quickly from left to right and front to back. Continue for approximately 20 seconds. Looks like a 2 handed affair and liable to dispense excessive quantities of sugar. Does anyone else make a smaller version? .... Does anyone else make a smaller version? So you pour the sugar into the bulb. I can imagine both of these devices can get gummed up with damp or even humidity. Yes, I removed the spout, half-filled with powdered sugar and use. When not in use I wrapped the end with "Blu-tack" to prevent moisture ingress. Sometimes a vigorous shake of the bulb was necessary to break up any lumps. GOOD NEWS. First inspection today and they made it through. Brood on 8 frames, and some drone comb capped. Over the winter they have had over 2.5kg of baker's fondant and Candipolline Gold. They seem to be loosing interest in it now. Loads of pollen coming in. No varroa treatment and I'm seeing a daily drop averaging between 15-20 and also seeing the casualties. When I see 8-10 of these struggling in the grass on a sunny day my resolve has been weakening. Some look complete, they just can't fly. But after having a quick look today I'm more positive. I would strongly suggest simply leaving them "bee." Don't open their hive up and try to "manage" them. Bees know how to thrive in hollow trees with no human intervention whatsoever. You will always find dead and dying bees around any hive: the entire life-span of a worker is only about one month, and there are thousands of them in there. So, merely seeing corpses does not mean that you have a problem, much less that you should intervene. What you're seeing is merely normal attrition. I simply make it my business to walk up to the hives and "watch the bees" every day or so. If something changes significantly, you will know. A few times a year, I'll harvest a little honey from the end bars of my hTBH ... enough to fill a few pint jars. Most of the honey is theirs to keep. Come fall, when the weather begins to cool, I stop harvesting completely. The bees take care of the "funny-shaped hollow tree" that I gave them ... any way they want to. And, magically enough, they do. My hives give me the honey that I want, with almost no expense, time or attention. Sorry just seen your response. My decision for my one and only colony was to treat with MAQS and cull a frame of drone brood in late April with a daily varroa drop running at 40+ approx. , 10-20 worker and drone crawlers each day outside the hive. 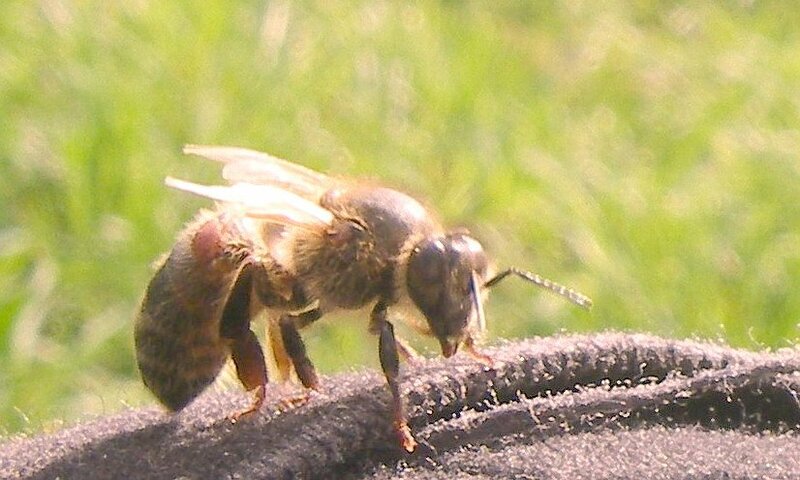 My reasoning was that this queen has no history of varroa resistance, and exists in a highly intensive agricultural area. There are very few feral bees locally. They don't have a good chance of surviving. If I did nothing I would be keeping a sick animal in my garden which is unacceptable. I like the idea of completely treatment free but Solomon Parker advocates having 5-6 colonies at least from which you can select the most successful. With fewer colonies you can't do this and may be simply keeping a sick creature if you are not working towards a better situation. I'm not a bee-haver. Today the colony has donated resources to 3 nucs, one for a purchased queen and 2 more have virgin queens at the moment. Once I have more colonies and more options I will try and avoid treatment and will select for varroa resistance in my breeding. I just wanted to say that Mike's suggestion of leaving them alone when they were clearly becoming overrun with varroa is not a good policy in my opinion and his logic regarding feral colonies surviving is flawed, as you so rightly point out, because there are so many other factors that can impact on the situation. What works for one person's bees in one situation may not work for another under different conditions. 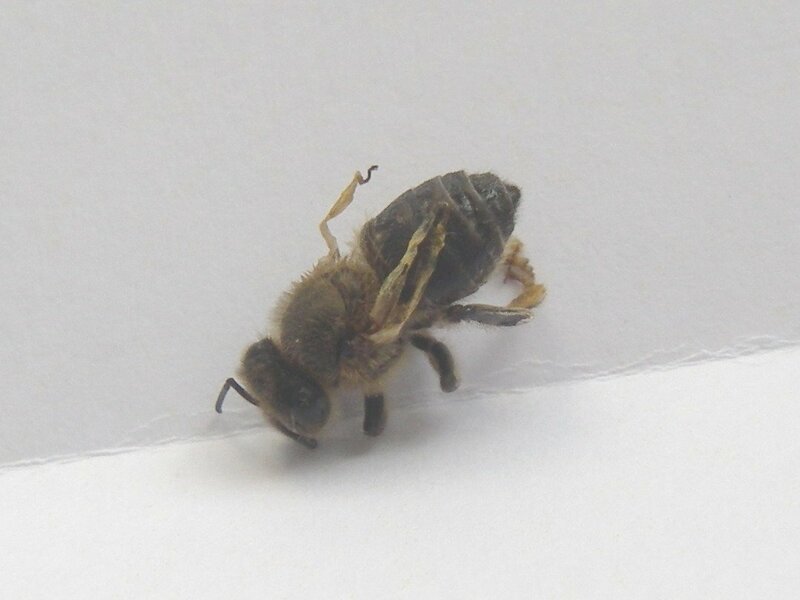 When varroa first arrived here in the UK, I saw massive levels of mites in my hive and baby bees with deformed wing virus and I have no doubt that if I had not treated them at the time, they would have perished. I treated with chemicals for several years, when levels of mites became very high but eventually I was treating them less and less often until it has now got to 7 years without needing to treat them and no problems with mites. Becoming treatment free was not a goal for me, it just happened by looking after my bees and only treating them when they needed it. I would encourage others to not focus too closely on the Holy Grail of becoming treatment free but just care for their bees as they see fit and hopefully they may end up treatment free....until they need to treat their bees again (I have not ruled out applying chemicals to my hives in the future although I would like to avoid that) or be prepared to let them die. I take tablets if I have a bad headache and give my animals medication when they are sick, surely bees deserve no less. 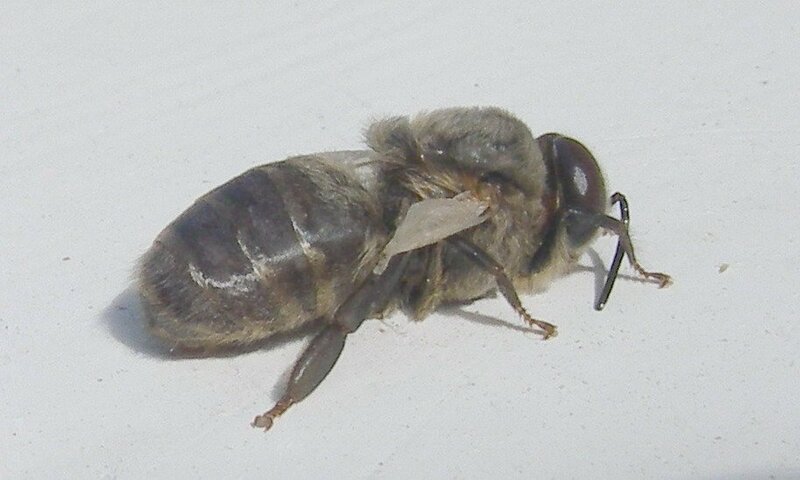 It is the routine seasonal treatment of bees for varroa regardless of whether they require it or not, that is, in my opinion, wrong, just like the routine use of antibiotics in farming or wormers in horses. Keep the medicines for when it is needed. Small scale hobby beekeepers like us, can monitor our bees more closely than large commercial operations and treat our colonies on an individual basis as necessary..... or hopefully not! The decision to use acid on my bees (to be dramatic) was helped by these guys. If a sick hedgehog turns up in my garden I take it to rescue. Their numbers have dropped significantly in recent years and they are endearing helpful creatures to have around. And yet I was seeing sickness in my bees and doing nothing. I've seen debate that insects don't suffer but what about me worrying about them. I think there are places in the UK where bees can forage without too many background effects from fungicides, pesticides and herbicides but not around me. A long term beekeeper at my local BBKA meeting said that varroa has forced us to be better beekeepers. More care and involvement with the bees is required which small beekeepers are able to supply. 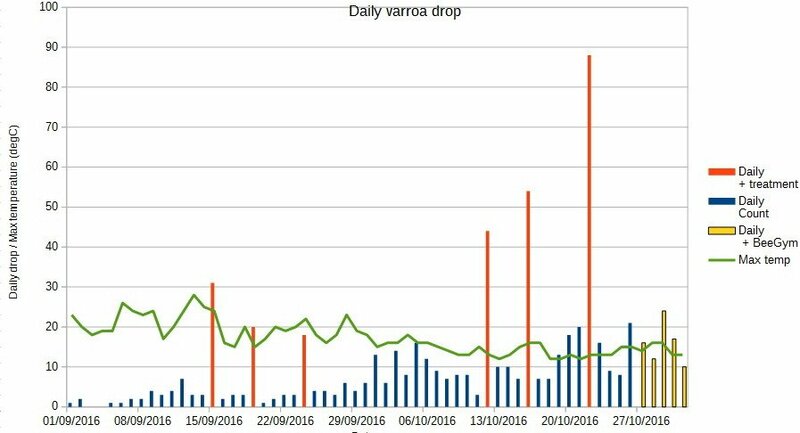 Well, the varroa drop is rising and I'm thinking of a series of icing sugar treatments on this now strong colony (National BB and 1/2) which has been the subject of this thread. They've made it through a year under the care of this beginner beekeeper and survived. I never considered beekeeping would involve such ethical soul-searching.